Folding bikes are particularly efficient when used in conjunction with public transit. Unlike regular bikes, they can be taken easily on buses, trains or ferries. In fact, some transit systems will only allow folding bikes to be taken on board. For a little extra weight, you get the benefit of going up hills easily, and this is often very important to commuters who do not work up a sweat before getting into work. Let’s take a look at one of the better folding electric bikes out there: a Dahon Mu P3 custom-fitted with a BionX electric assist motor. This bike is called Dahon Conversion and it’s sold by NYCEWheels for $1899 (see photos above and below). The Dahon Conversion weighs just 42 pounds. It can be folded in less than 20 seconds into a size roughly 13″ x 25″ x 30″. The folding of the bicycle requires the loosening of 4 clasps and the bicycle collapses to its folded size without removing any of the wheels or adjusting any of the gears. The wires are out of the way and do not obstruct the folding and require no special attention in the folding process. The bike has a range of 20-30 miles. This version of the bike uses a 250 watt motor and NiMH batteries. If you spend more, you can get a 350 watt motor (add $230) or lithium-ion batteries (add $300). The BionX standard system includes a control console, a battery and a motor. The control console includes a multi-functional odometer, four assistance levels, four generative settings as well as a battery charge indicator. You can also create your own folding electric bike. For example, to recreate the Dahon Conversion you could get the Dahon Mu P3 (about $590) and install the BionX motor system yourself (kits start at $1100). Of course you can also use other folding bikes and electric assist kits . Some kits are available for less than $500, however I can’t vouch for their quality. There’s also DVD that will tell you how to fit your bike with an electric motor — its a bit hokey but it shows the basic method of installation. Another folding electric bike is the iZip EZgo. This inexpensive bike by Currie Technologies, will help you pedal for 18 to 25 miles with speeds up to 18 mph. The bike weighs 53 pounds, including the motor. The EZgo has a simple twist throttle with a battery gauge. The wheels are 16″ heavy duty alloy with stainless steel spokes. The bike also features an integrated rear carrier to take some items on the go with you. It’s available from Amazon for $649. The bike’s home page is here. Biontague is a folding electric mountain bike, created by Electric Cyclery. 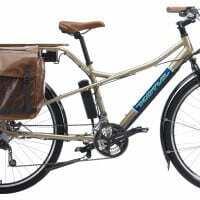 It’s a Montague Swiss Bike LX folding mountain bike fitted with a Bionx PL350 electric conversion kit. The Biontague bike offers speeds in the 20 MPH range, great hill climbing assistance, and a range of up to 60 miles on a 3-hour charge. The Montague Swiss is a mountain bike that folds for easy transport and the whole thing weighs only 43.2 lbs. A 36-volt lithium-ion battery pack is mounted down low on the frame. Question: Will you benefit more from a bike that weighs little and can be packed into the trunk of a car, or one that has a longer range and higher top speed? Answer: BOTH, meet the Neo Velox the lightest hi capacity electric folder that rides like a regular bicycle. That’s great, I never thought about that like that before. trés sympa c’est modeles de vélos electriques.J’espère que je pourrais posséder un . Super light weight and portable bike is perfect for recreation. With petrol prices increases, these folding electric bikes makes more and more popular than ever. The durable frame with an adjustable saddle, ultra soft and adjustable handle bars for comfort. This can also used as a regular bike. On NPR or PRI, I heard about an electric bike that can be charged, at home, while being used as an exercise bike but I can’t find info onit. Has anyone else heard about this? I woul dlove to harness energy from exercise equipment. Can anyone provide info on how to do this or someone who sells such equipment? Does anyone have any info on the SunL SEB-18 Electric Assist folding bicycle? We need a new battery and are not sure what to look for. sent is actually a few pounds lighter than the old one it replaced). I have the 2001 or 2002 version of Lee Iococa’s Mini E Bike. How does that rank competitively quality wise in 2008? Where can I buy a new battery and battery charger? Bikes like these are awesome and I’m totally digging the idea of making one for myself. wow. very cool stuff!! thanks for passing along. Based on the folding bike Beixo (www.beixo.com), chainless (with a gimbal) so it’s low maintenance and not dirty, with internal gear hub (Nexus 3 speed) low maintenance as well. The electric motor is then located in the front wheel which gives the bike a good balance.